The Reasons Why Israel's Military Is In Such A Tough Fight : Parallels Israel's military has been the dominant Middle East force since the 1967 war. Yet for the third time in a decade, the army is bogged down in a protracted fight with Islamist militants. 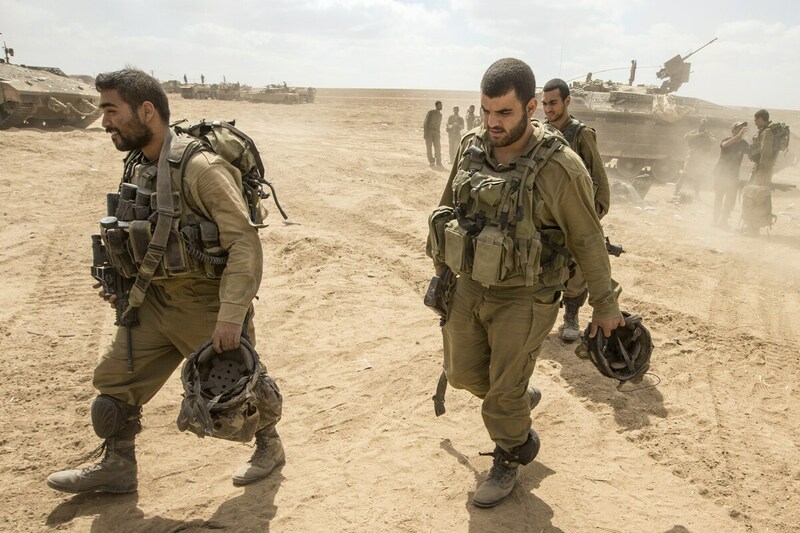 Israeli troops come out of the Gaza Strip on Friday following combat operations in the territory. Israel's military is the strongest in the Middle East, but has waged a series of protracted fights in recent years without winning clear-cut victories. Ever since its sweeping victory in the Six-Day War of 1967, Israel has been regarded as the dominant military power in the Middle East. No Arab state has risked a full-fledged war in decades, and few question the conventional wisdom that Israel would swiftly defeat any national army in a traditional, head-to-head confrontation. Yet for the third time in the past decade, Israel's powerful military finds itself in a protracted, messy fight with a small, elusive, Islamist group and has been unable to score a quick and decisive victory. The current bloodletting between Israel and Hamas in the Gaza Strip is nearly three weeks old and Israel has pounded the Palestinian territory, leaving more than 800 Palestinians dead, most of them civilians. Yet Israel has not halted the Hamas rockets and is still working to destroy a tunnel network it's cited as the main reason for the operation. Hamas leader Khaled Mashaal, speaking from his exile base in Qatar, said Hamas fighters have "destroyed the idea that the Israeli army is invincible." Mashaal is hardly a neutral observer. Still, Hamas slugged it out with Israel for three weeks in December 2008-January 2009 and is demonstrating now that it has recovered to fight again on the same terms. And back in 2006, Hezbollah fought Israel for 34 days in southern Lebanon before a cease-fire was declared. Israel delivered a ferocious blow and its northern border has been largely quiet since then. However, Hezbollah only grew stronger in the aftermath, becoming the dominant force in Lebanon and remaining a potential threat to Israel. So why has Israel been frustrated repeatedly in these battles? A Palestinian runs through an area damaged in an Israeli airstrike in Gaza City on Thursday. The Israeli military has unleashed a major air and ground campaign in the fighting that's nearly three weeks old, but Hamas continues to fight back with rocket fire. Hamas And Hezbollah Now Fight More Like Armies: Both Islamist groups emerged in the 1980s and initially carried out individual attacks, such as car bombs and suicide attacks. But they evolved into forces that now resemble traditional armies, while retaining many of their guerrilla tactics. Both groups have thousands of trained fighters and large stockpiles of weapons that have allowed them to wage sustained battles in the face of a major Israeli assaults. Shlomi Eldar, an Israeli television reporter who has covered the Palestinians for years, wrote that after Israel withdrew its military from the Gaza Strip in 2005, Hamas "underwent a strategic change:"
"From small terror cells, it developed into a real army. Hamas became an organization of uniform wearers whose daily pursuit was military; they were trained according to the doctrine of a recruited army. They underwent weapons training and developed excellent military skills, together with religious indoctrination to strengthen their faith and adherence to the jihadist cause. Thus, in effect, Hamas created the first Palestinian army." 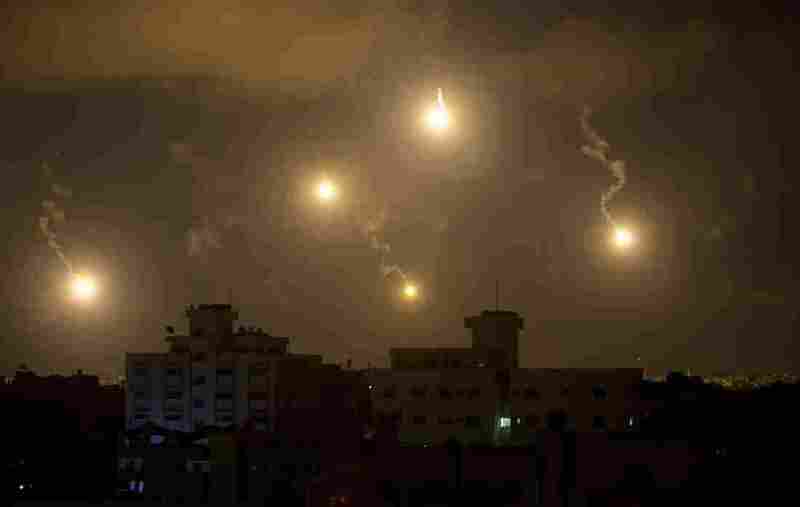 Israeli army flares illuminate the sky above the Gaza Strip on July 18. After waging an air campaign initially, Israel has sent ground troops into the territory. When Hamas first fired rockets from northern Gaza into southern Israel in the early 2000s, the weapons were crude, homemade contraptions that barely made it across the border. Hamas sometimes cut down streetlight poles to use as launching tubes. Not surprisingly, the rockets were so inaccurate they sometimes missed Israel altogether and landed in the Mediterranean Sea. Compare that to now: Hamas had an estimated 9,000 rockets going into the current round of fighting, including some from Iran that can reach Tel Aviv, some 40 miles up the Mediterranean coast from Gaza. One rocket landed Tuesday near the country's main airport outside Tel Aviv, and U.S. and European airlines briefly stopped flying to Israel. Different Definitions Of Winning And Losing: The Israelis are looking for a comprehensive victory that permanently weakens its opponents politically and military. In contrast, Hamas and Hezbollah have sought to show they are leading the resistance to Israel and can fight the much stronger enemy to a draw. By these definitions, some analysts say that Hamas and Hezbollah can win by not losing and Israel loses by not winning. "No matter how and when the conflict between Hamas and Israel ends, two things are certain," writes Ariel Ilan Roth in Foreign Affairs. "The first is that Israel will be able to claim a tactical victory. The second is that it will have suffered a strategic defeat. Wars are fought to realign politics in a way that benefits the victor and is detrimental to the loser. But the Israelis have lost sight of this distinction." In this round, as in previous fights, the casualties and the destruction are overwhelmingly on the Arab side. But after past conflicts, Hamas and Hezbollah held parades to celebrate. The Israeli public, meanwhile, engaged in soul-searching debates as to why the military didn't achieve more. It's already happening this time around. "Angst over the highest military toll since the 2006 Lebanon war now mixes with a cocktail of emotions: on one hand, a strong current of determination to press on with efforts to end the rocket fire from Gaza; on the other, the sinking feeling that a quagmire is at hand," Dan Perry and Aron Heller of the AP wrote this week. Luring Israeli Ground Forces Into The Fight: Israel attacked Gaza from the sky, but didn't deliver a knockout blow. So once again, it has ended up sending in large numbers of ground troops, exposing them to ambushes in congested towns and cities. "Israel needs to go in on the ground to achieve its objectives — but ground operations can lead to Israeli casualties that actually undermine its deterrence," wrote Daniel Byman in Foreign Policy. Israel has suffered more than 30 deaths, almost all of them soldiers, compared to the more than 800 Palestinian dead. "That said, it's still a significant number for Israel, and Hamas can claim it is making Israel pay in blood," Byman added. Also, it's no secret that Israel does not want to keep its ground troops exposed for extended periods as it did previously. The Israeli military occupied Gaza for nearly four decades before leaving in 2005 and was in southern Lebanon for nearly two decades before pulling out in 2000.
International Criticism: All Israeli military operations are closely scrutinized and the government must weigh any military gains against the intense international criticism that it faces. The military achievements often prove temporary at best, while the political fallout can last indefinitely. Israel's Prime Minister Benjamin Netanyahu has always been a deep skeptic of peace talks with the Palestinians. Some critics say Netanyahu is using the fighting to undermine the recent unity deal between Hamas, which rules Gaza, and Palestinian Authority leader Mahmoud Abbas, the top figure in the West Bank. But the fighting has put Israel back in the international spotlight and reignited debate over Israel's strict controls on Gaza, where it limits the flow of people and goods going in and out of the territory. To date, the fighting has not produced clear advantage for either side, and that points to the prospect of another round in the future. "Even if the latest fighting yields months of peace, Israelis assume that they will have to again strike at Hamas, and perhaps even Hezbollah," according to Byman, a Georgetown University professor who has written extensively on Israel's military. "Israel feels compelled to act on a regular basis to ensure its deterrence achieves at least the partial results of limiting the wars and making them less frequent. 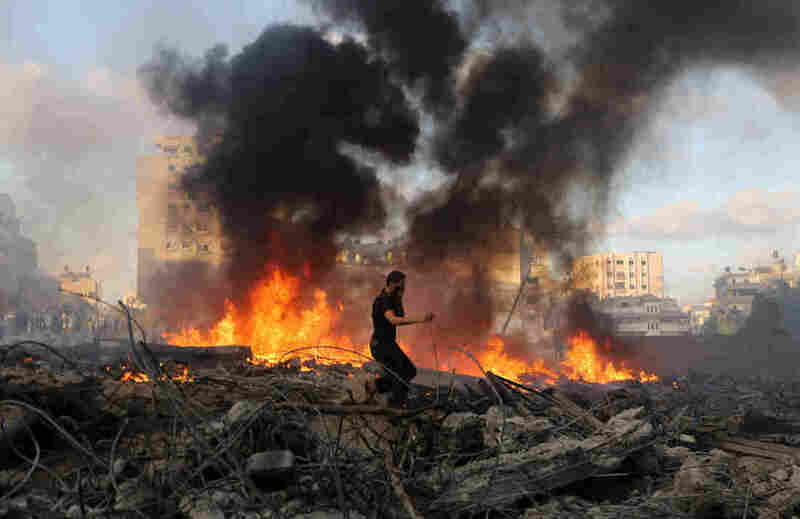 So even if the latest fighting in Gaza ends soon, it won't be the last round." On Saturday, a humanitarian cease-fire lasting 12 hours could begin in Gaza and the truce would allow Palestinian civilians to get food and aid where it's needed, officials say. Hamas says it has agreed to a temporary peace and Israeli media are reporting Prime Minister Benjamin Netanyahu has also approved the plan.